The principles of the Declaration of Independence constitute the soul of the American Founding and form the moral basis of government in the United States. The Declaration is a clear and concise statement of the principles that drove the American Revolution, and served as the basis for the Americans’ appeal from British rights or law to the natural law. The first principle of the Declaration is equality, which means no one is by nature the ruler of another. Equality gives rise to natural rights, which are inherent and inalienable, and include life, liberty, the pursuit of happiness, property, and religion. To secure these rights, human beings consent to leave the state of nature and form a government, which protects our rights through such means as national defense, criminal laws, civil laws, and minimal support for the poor. The right to consent requires the unanimous agreement of the individuals forming the government to give up some natural liberty in return for the security of rights, which is the government‘s sole purpose. The majority rules in everyday politics, and consent is maintained through elections. Should a government become unjust, violating rather than protecting rights, the people may exercise their right to revolution. The Constitution is a product of these ideas and the experience of the Founders. The Founders’ experience of government under the Articles of Confederation—which led to legislative tyranny of the majority and the general incompetence of government—taught the Founders that consent must be structured, that good government requires something more than a legislative branch. The key feature of the Founders’ constitutionalism is separation of powers, which produces two important results. First, separation of powers links constitutional means and personal motives in order to prevent one branch from dominating the other two. 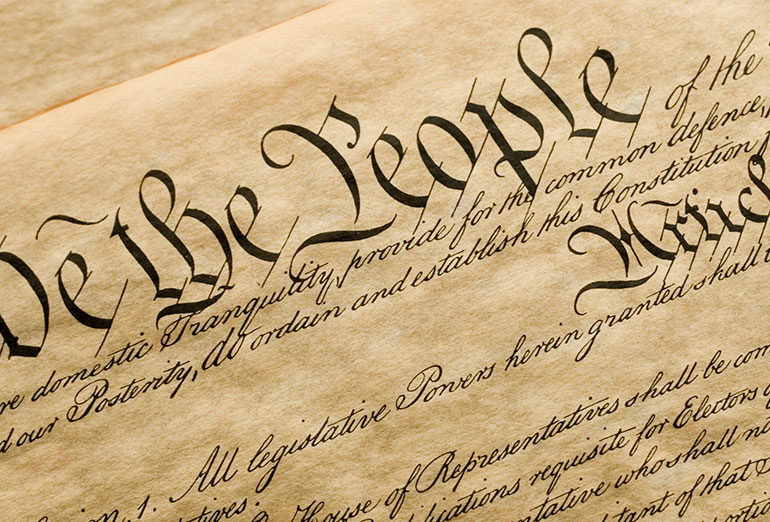 By connecting personal motives or ambition to constitutional means such as checks and balances or the presidential veto, separation of powers works to prevent tyranny. Second, separation of powers recognizes the existence of three powers in nature—executive, legislative, and judicial—and by keeping them effectively separated allows each one to do its job well. The separation of powers fosters good government—a deliberate legislature, an energetic executive, and a judicious judiciary. A government founded on the basis of these principles secures and fosters a republican way of life that brings about peace, justice, safety, and happiness. Below you’ll find a list of Hillsdale’s best resources from Imprimis, the Kirby Center’s lectures, and the College’s faculty; key primary sources from The U.S. Constitution: A Reader; a selection of books for further reading; and a timeline of critical events in American history.